Jeff Williams and Noah Carr kick off the event by acting out a negotiating scenario. Perhaps an ironic way to open a workshop on sales negotiating, but Jeff Williams, former head of sales at FireEye and current Bain Capital Ventures operating partner, has taken companies from $0 to $1 billion in revenue. 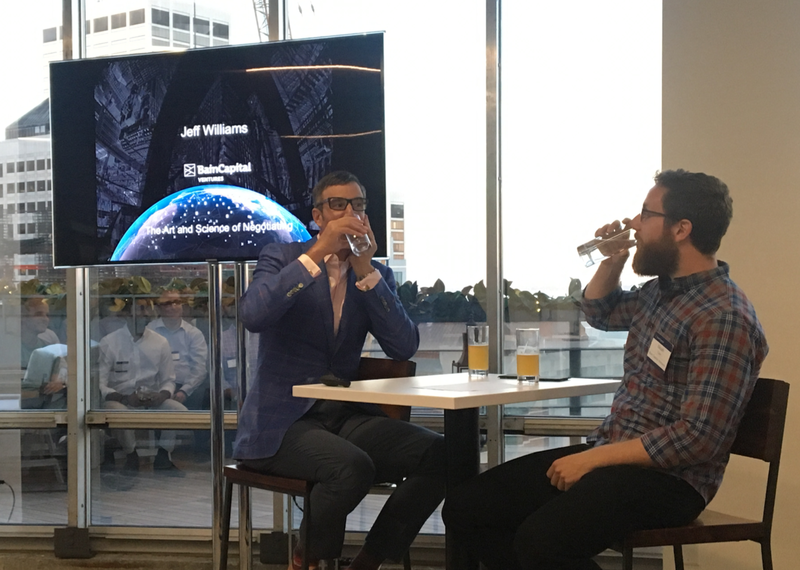 For a crowd of startup sales leaders gathered at our San Francisco office last month, Jeff caught their attention as he proceeded to share his best trade secrets and revealed the art and science of negotiating. While we can’t give away all of Jeff’s best secrets, here are his “golden rules” for approaching, handling, and finalizing a negotiation. Before you even start discussions with a potential customer, know this: never sell. People don’t want to be sold to — they want their problems solved. Listen to your customer, identify their business problem, and use your product to find the solution. Tip: Considering offering a discount before demo-ing your product? Wait. If you offer a discount prior to showing the value of your product, you’re diminishing the overall value of the product. Again, don’t sell, wait to understand the issues, and then offer solutions. Have integrity: Salespeople have the unfortunate stigma of only thinking about closing a sale. To overcome this, position yourself as someone the buyer can trust — stick to deadlines, be honest, and keep communication lines open. If the buyer sees you as someone with integrity, say as someone whose “lowest price” is actually the lowest price, negotiating becomes a much easier process. Get an internal executive sponsor: While the technical person who contacted you may be spearheading this project (and be faced with the problem the company is trying to solve on a daily basis), you need to identify the executive sponsor that owns the budget. Once identified, get this person’s buy-in on what is important to the company. It is the executive sponsor/decision-maker who will be pulling the purse strings, choosing the business terms, and leading negotiations later on. Tip: Selling a product that will be used by more than one team? Find out who owns both budgets or leads both teams, and ensure you have their sponsorship. Get the technical win: Always bring in your solution architects or technical teams in to help demonstrate technical superiority. Listen to the customer to identify their success criteria and make sure your proof of value is designed around it. Remember, this is not a sales motion. Once you get that technical win and prove your product’s value versus the competition’s, you are now in a position of strength at the negotiating table. Bring support in early: Your support team is the face of your product to your customers. They know the product, understand customers’ problems, and are not sales-driven. Buyers inherently trust your support team because they are not paid to sell your product, but instead to help the buyer understand and operationalize it. Bringing them in before a deal is made is an effective way to build trust and prove your integrity. With this, you’ve built trust and proven the value of your product. Here is when you bring a deal to the table and negotiations can start. Now that negotiations have begun, be sure to enter the conversation from a position of strength — keep your composure, be confident, and most importantly, remember that silence is golden. Sure it can feel awkward when you practice this initially, but the results will be worth it. Listen and wait for the buyer to speak first, hear what they have to say, then offer your solution. Once you start to get desperate or sell past the close, you’ve lost the deal. Tip: Another way to come from a position of strength: avoid the end of your quarter. This will help you avoid the EOQ rush and a desperate sell. If you’re lucky, you’ll sign a deal on the spot and the process will be smooth. Congratulations, you did it! Establish a point of diminishing returns: Ideally, every transaction is a win/win — the customer pays fairly for the value of your product or service, while the margins allow you to deliver the level of innovation and long-term support they will demand. Work with your teams to establish a number that makes this win/win possible, and don’t let a price for your product drop below that point. If that’s what the customer needs in order to buy, it’s time to walk away. Create a discount matrix: Make a chart of who can give what discounts on your product based on their level within your company. For example, the mid-level salesperson can give a 20% discount, the head of sales can give 40%, and only the CFO can give more than that. This way, if a buyer needs a certain discount level, you know who to consult and can speed up the negotiating process. Never discount or minimize support: Support is the MVP of your sales deal — they are key in ensuring your customer uses your product fully while acting as their trusted, non-sales-oriented product expert. Don’t let a buyer talk you out of the full support stack. If they refuse, know that your product requires the support allotted, and walk away. Tip: Is the deal getting stuck in the procurement department and you’re no longer negotiating with the actual buyer? Walk away. It is procurement’s job to get the deal through, as at this point it’s already been approved by the buyer. You’ll find the stakeholders will get involved again if the deal fails. These golden rules: Never Sell; Build Trust; Come from a Position of Strength; and Know When to Walk Away should allow you as a seller to avoid negotiating as much as possible and win. Want to be invited to our next sales event? Subscribe to our mailing list here.